Exposure's most powerful rear light, the eye-catching Blaze DayBright Tail Light features three brightness levels, side illumination for added peripheral visibility, and a Fuel Gauge that displays the remaining battery life to let you know when to recharge. 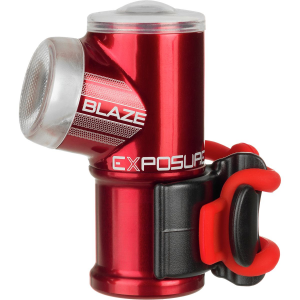 On the high setting, the Blaze maxes out at 80 lumens and runs for six hours, while the pulsing mode squeezes two full days of life out of one charge to keep you well-seen without having to plug in. The included USB cable lets you recharge quickly and easily, while the CNC-machined aluminum housing is durable and water-resistant for functionality in varying conditions.